This one was first posted over at Crafts Unleashed but I thought I would share it here in case you missed it. 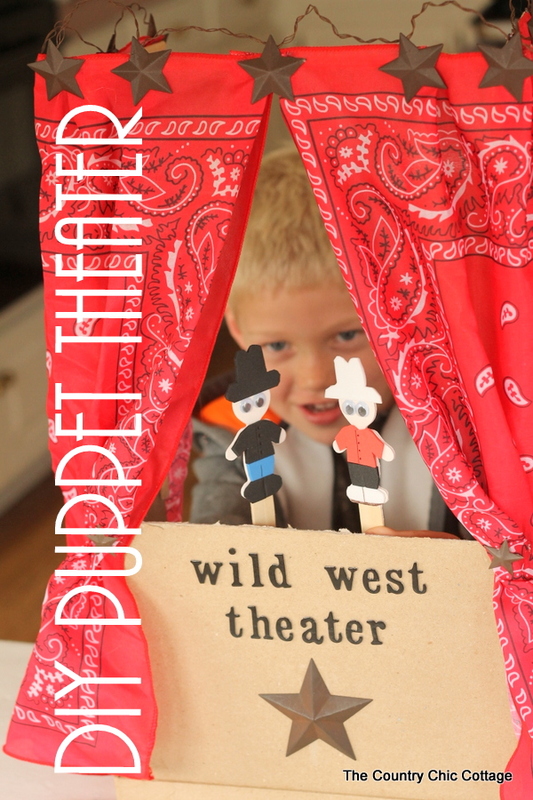 My wild west puppet theater for kids is the perfect way to spend a rainy day. A few supplies and you can be on your way to a fun theater full of imagination. Plus this is a small project that can be easily stored when not in use. I always worry about storing those huge puppet theaters when the kids are not playing with them. Lets turn a dreary rainy day into a day filled with smiles and laughter. Some of the links below are affiliate links. A portion of your purchase will go to support this website. We are going to start by making the theater then we will move onto the puppets. Using the 10 inch rectangular box, cut off one long side with a craft knife or scissors. 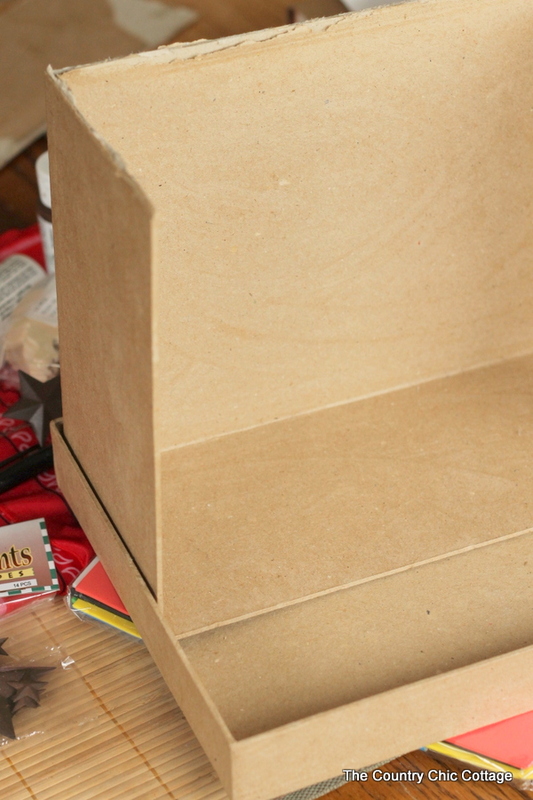 Then hot glue the box into the lid as shown below. 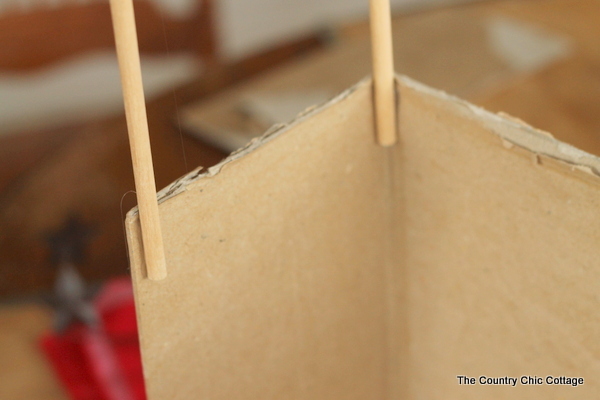 Hot glue four dowel rods into each corner of the box. 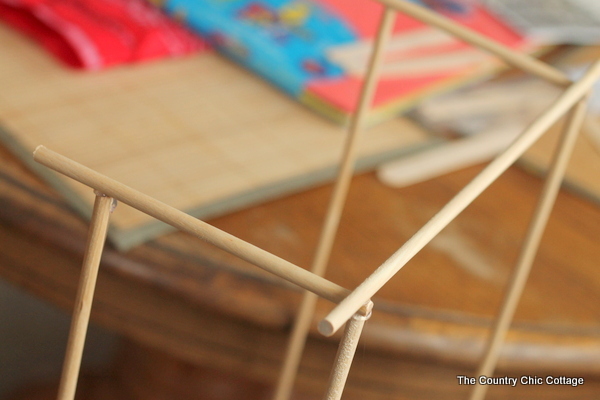 Cut one dowel rod in half and lay half on each end using hot glue to secure. Lay one whole dowel rod across the front again securing with hot glue. The rods should look like the image below. Lay one bandanna out across half of the theater. Gather to fit and hot glue into place. 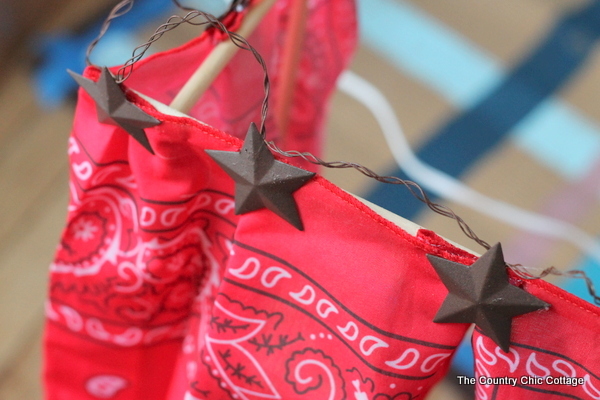 I gathered in as many areas as there were stars on my rusted metal star garland. Then just hot glue the stars into place over those gathered areas. It is starting to look a little wild west already. 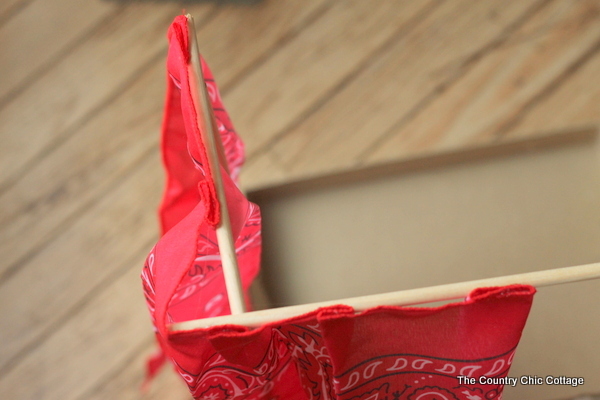 Gather the front of the bandannas onto each side of the puppet theater box and secure with hot glue. I added a rusted star on each side as well. Add the name of your puppet theater on the front with the Thickers alphabet stickers. 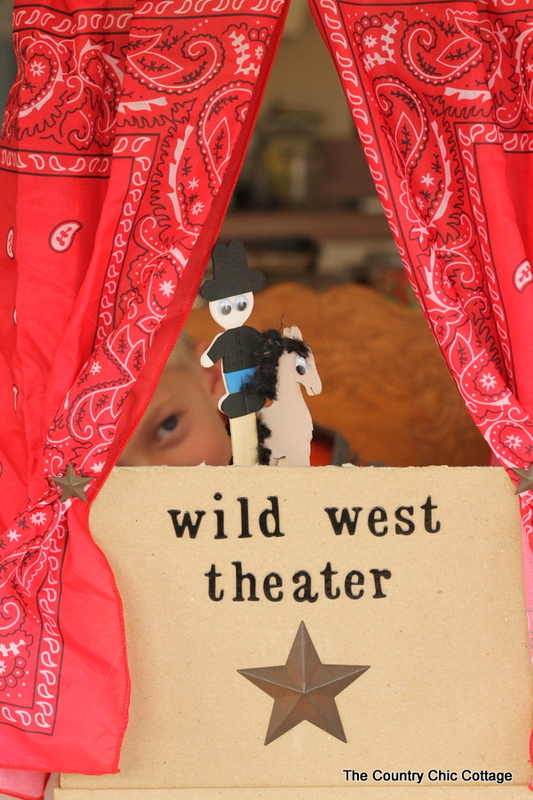 We are the wild west theater around here. I also glued one of the largest rusted metal stars to the front. Let get started on those adorable puppets. 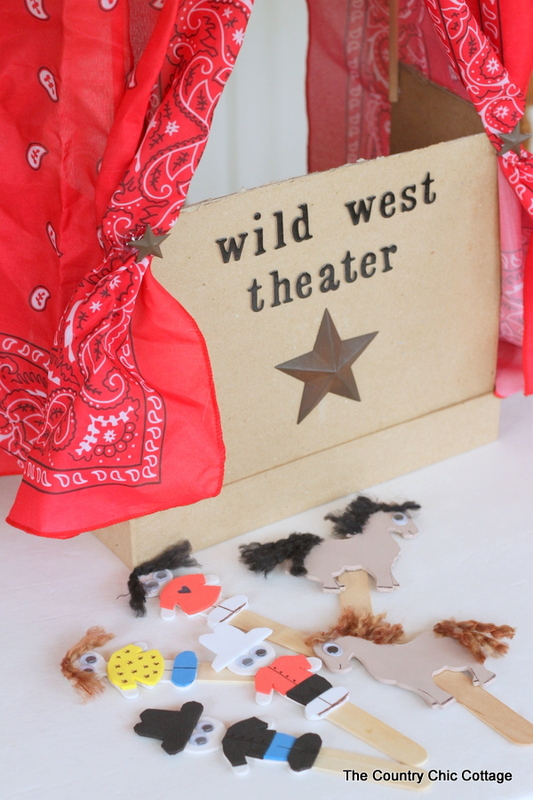 We need cowboys, cowgirls, and of course horses for our puppet theater for kids. I mixed the white with a little burnt umber for the flesh color of my people puppets. I then added more burnt umber for a light tan on the horses. I painted both sides of my puppets just to make everything look nice. Allow them to dry completely before continuing. The cowboys and girls get clothing made from the foam sheets. 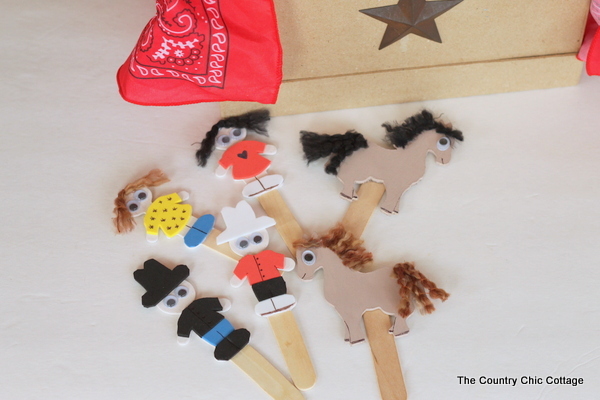 Let your children cut various shapes and add them to the wood puppets with tacky glue. Remember that hot glue will melt the foam! 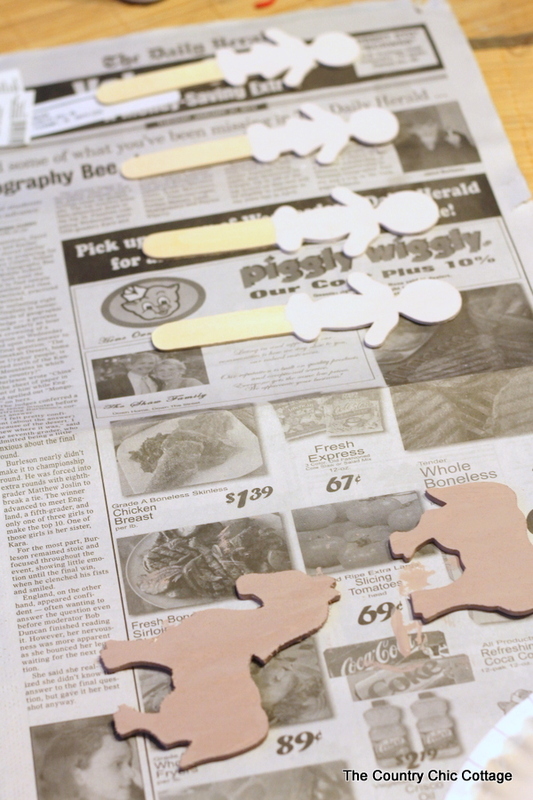 An easy way to get the correct size for the clothing is to lay the wood shape on the foam and trace around. Draw right on the foam with a Sharpie to add some embellishments. Use hot glue to add eyes plus yarn hair on the girls. 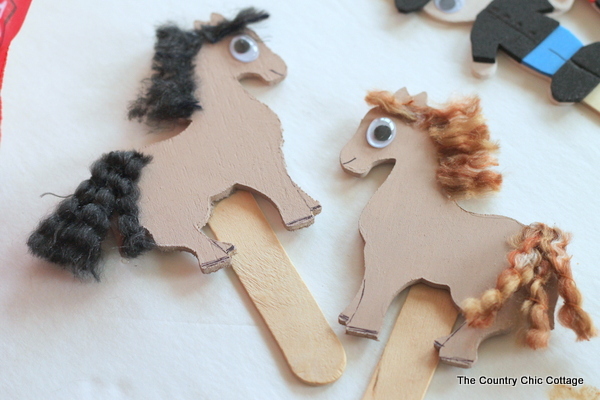 For the horses, glue on yarn for the tail and manes with hot glue. You can make the mane long and then trim once it is attached. Add a movable eye using either hot glue or tacky glue. Then use a Sharpie to add a mouth, legs, and hooves. 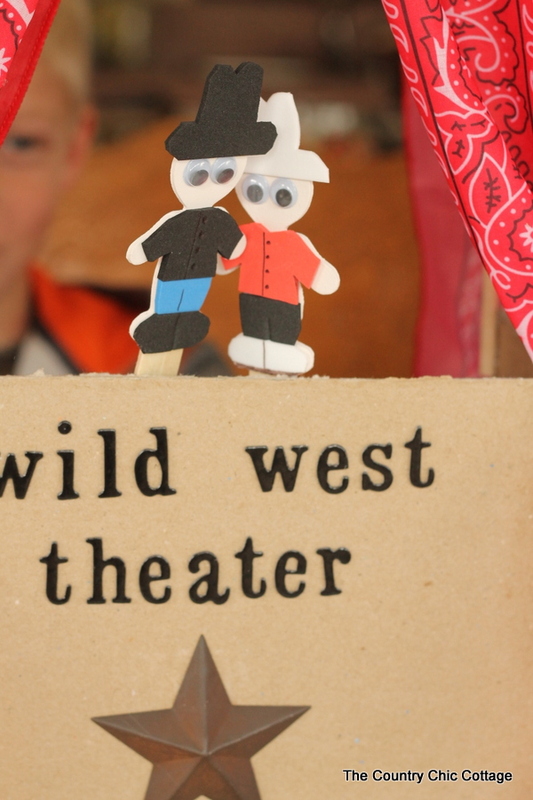 Let the kids choose what puppets to make for the theater as that is part of the fun. Once everything is dry this is ready to play with! Act out scenes and turn any rainy day into a day of fun. Will your cowboys do battle over the cowgirls? Or maybe jump on a horse and ride into the sunset? Either way this puppet theater for kids is likely to be a hit at your house. 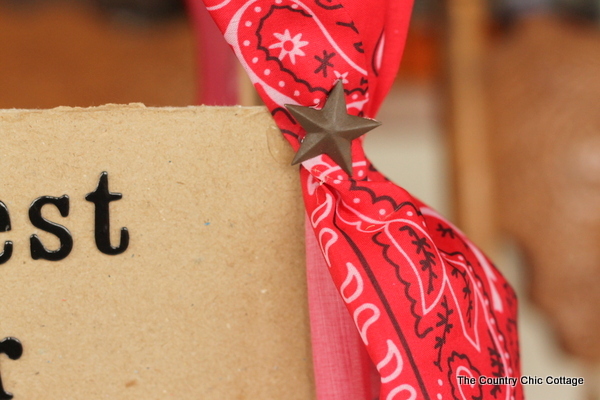 Let your kids pick a different theme if the wild west is not their thing. 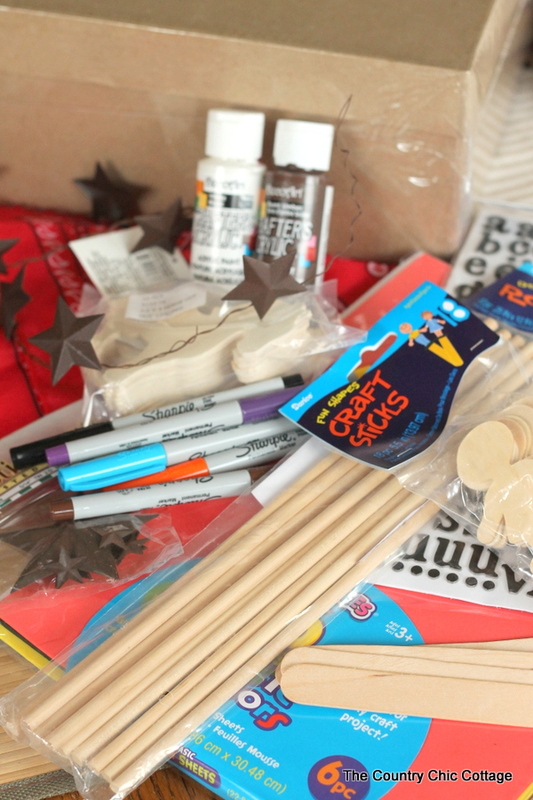 The same type of supplies should make any type of puppet theater you can dream up. 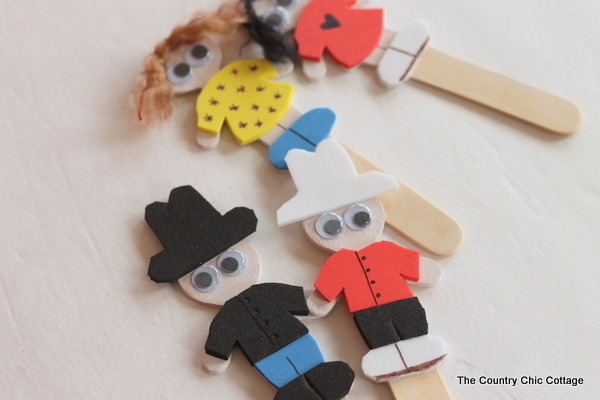 This great craft will help to flex those imagination muscles in your kids. Don’t worry…adults can join in as well! 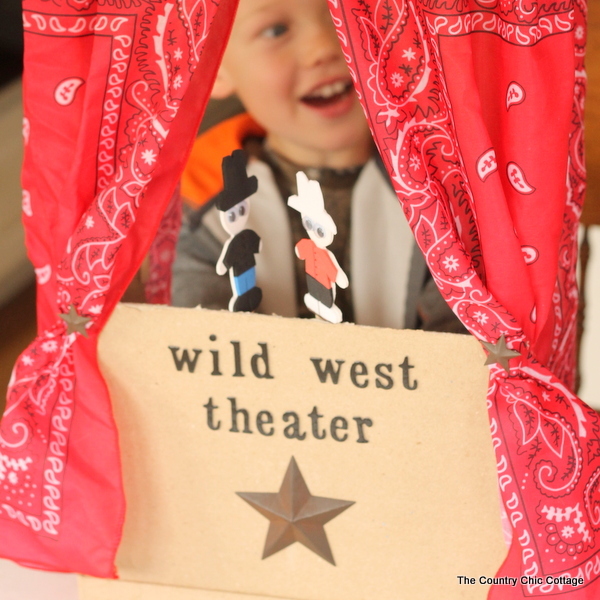 Make this wild west puppet theater for kids soon before those kids grow up and don’t think cowboys with horses are fun anymore!